A new, exciting, and intuitive way to learn English, this self-study English course book for beginners is uniquely visual, engaging, and easy to follow. 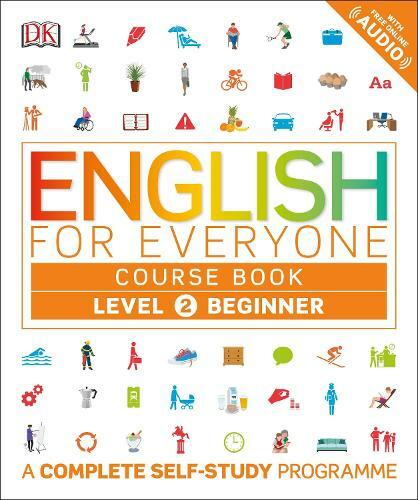 The English for Everyone Level 2 Beginner Course Book combines a carefully graded, step-by-step approach with innovative visual teaching methods to make the English language easy to learn. Key language skills, grammar rules, and English vocabulary are explained in a clear and simple way, with attractive illustrations to put new language in context. Listening, speaking, reading, and writing exercises are presented in bite-sized modules, allowing you to learn at your own pace. Suitable for beginners who already know the basics of English, this course book will take your English to pre-intermediate level. It introduces topics such as emotions, actions and activities, and dates, months, and seasons. English for Everyone is aligned to the CEFR, the international standard for language learning, and ideal for preparation for major English-language exams including IELTS, TOEIC, and TOEFL. Whether you want to improve your English for work, study, or travel, the Level 2 Beginner Course Book will make it incredibly easy to teach yourself English.